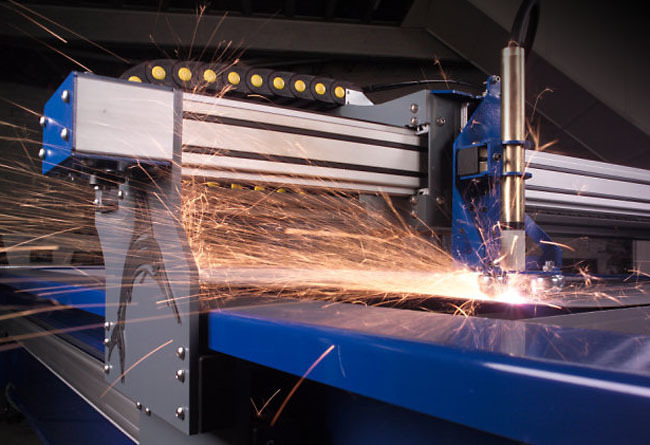 A unique combination of simplicity and cutting-edge design is boosting the popularity of a new generation of CNC machines from plasma cutting specialists, Techserv. Increased productivity, improved component finish and unparalleled serviceability have already earned the Blue Marlin repeat orders, a string of international sales and satisfied customers including TATA Plc. Popular in a massive range of sheet metal cutting applications, particularly the manufacturing of ducts for heating, ventilation and air conditioning systems (HVAC), plasma cutters are famed for their low initial purchase and running costs and the huge increases in productivity they make possible. A range of features has helped Techserv capitalise on this popularity with their latest high- performance introduction to the market. “The choice of materials and overall build quality of the Blue Marlin really set it apart from the competition in terms of performance, but Techserv’s wealth of experience and the accessibility of our support team also provide our customers with genuine long-term peace of mind”. The Blue Marlin’s use of extruded aluminium signals a major innovation in plasma cutting machine design and dramatically reduces the weight of the machine’s carriage for increased acceleration, deceleration and agility. This in turn leads to significant improvements in both positioning time (20m/min) and overall throughput (6m/min), as well as an unusually high finish quality for circular, curved and other component shapes in steel of up to 10mm thickness. Laser cut and CNC folded in 4mm mild steel, the Blue Marlin’s robust construction and twin longitudinal drive also contribute to the machine’s no-compromise build. Quick installation, ease-of-use and serviceability have also proved a big hit with Blue Marlin customers, and coupled with an impressive 3-year warranty help to reduce potential downtime to an absolute minimum. The inclusion of a standard PC-based touch-screen control terminal keeps operator training to a minimum while ensuring that replacement parts are cheaply and readily available from mainstream computer component outlets.